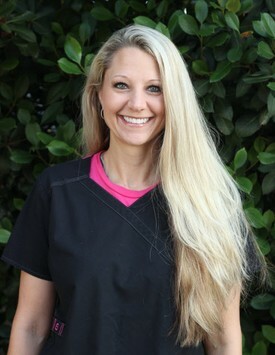 Meet our Hygienist | San Angelo, TX | Reel D.D.S. My name is Jess, I'm the lead hygienist at Reel Family Dentistry. With my love for life, I grew up in Colorado, Utah, Oregon, and Arizona where I attended Arizona State University my first two years of college. Then moved to San Angelo and finished up my undergrad at Angelo State University in Psychology/Biology. I then obtained my Associates in Dental Hygiene from Del Mar College in Corpus Christi, TX. I'm married to my wonderful husband Steven and we have two beautiful children Wyatt and Mylieh who attend school at Wall Elementary. I also have three amazing step children, Jordan, Saegan, and Edwin. As a Christian Family we attend church at Glen Meadows Baptist Church. Being active and full of energy, my hobbies include; Coaching Volleyball, Working out, traveling, reading, and sending time with my family! I also have a love for Medical/Dental Mission work in Africa! I've been working in Dentistry since 1995. Having a love for the field I enjoy sharing my views on how important dental care is for our patients. I especially love working with Children. Although my specialty is in treating Periodontal Disease. Being very passionate about our overall health, especially oral health, I strive to educate our patients in any and all areas of healthcare. Staying up to date with dental technology is important to me. I learn and grow each day. My latest achievement is becoming Soft Tissue Laser Certified.